Welcome to my blog feature, Building Character in which you get to meet a character from a book. Talking to a character outside of their book is fun! Huge. Amounts. Of fun. This week Strands of Thought is host to Meg Flannigan from Love All. Welcome, Meg. Tell us readers a little about yourself and what your life is like. Hi! I’m Meg Flannigan. I’m 17, a senior, and a varsity tennis player. I’m also dating a really hot guy named Ash, who happens to be the quarterback of the football team and a total sweetheart. And my best friend is Grayson. She’s trying to make the varsity tennis team with me this year. It’s great to meet you Meg, but I have to admit, your life sounds really normal for a senior in high school. Certainly you have some issues you’re working out. It’s okay, you can tell us. This isn’t easy to talk about at all, but here it goes. When I was a sophomore, my boyfriend cheated on me with a freshman. A freshman! I caught them making out in front of my locker. Since then, my confidence has been shot. Now, I have an amazing boyfriend, Ash, but… my crush of the past two years, Noah Turner, decides to finally notice me. I have two amazing guys to choose from, but believe me, it isn’t easy. Yeah, that’s more like what I’d expect a girl your age to be dealing with. And it’s so hard! What have you learned while trying to resolve your conflict? No matter how hard you try, you can’t control your heart. Tell us about Grayson. What makes her your best friend? Grayson tells it like it is, which I love. She really cares about her friends and will do anything to protect them. She’s short and curvy in all the right places. And she has the most gorgeous tan year-round, thanks to her bi-racial father. Yes, I’m a little jealous of how pretty she is. The only bad thing about Gray is that she thinks we should be together 24/7, which is tough considering I have a boyfriend. We’d love to learn more about you. Is there anything about you that people are always giving you a hard time about? How do you feel about it? My mom says I can be “feisty” sometimes with the comments I make. I have to admit it’s gotten me in trouble at work a few times, but Larry is impossible to work for so you can’t really put all the blame on me. Anyway, I’m trying to work on keeping some comments to myself. What are your three favorite leisure activities? Playing tennis, hanging out with Ash, and hanging out with Grayson. Meg, it’s been great getting to know a little about you! Thanks for stopping in and we hope your story gets into the hands of gazillions of teens around the world. Seventeen-year-old Meg Flannigan wasn’t very lucky at love. In sophomore year, her idiotic boyfriend dumped her by making out with another girl in front of her locker. Ouch! Now a senior, and with a little more self-confidence, Meg catches the eye of not one, but two guys at school. Lucky! Both attend her tennis matches, vie for her attention, and are each gorgeous in their own way. So what’s the problem? Meg has already chosen one of them, and the one waiting in the sidelines will do anything to change her mind. She’s enjoys the attention right up until it’s her heart that’s caught in the middle, and she risks losing both. Can Meg Love All, or will choosing be her undoing? 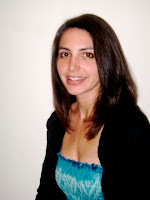 Kelly Hashway writes young adult and middle grade novels as well as picture books. She’s represented by Lauren Hammond of ADA Management. Some of her upcoming books include, Touch of Death, Love All, Serving Up Heartbreak, Perfect Match, Stalked by Death, Into the Fire, and The Monster Within. When she’s not writing, she works as a freelance editor, but her biggest job of all is Mom. If you have a character from a children’s, tween or young adult book that you’d like to see interviewed on Building Character, please contact kaistrand at yahoo dot com. Loved the tone of this interview!! So great to meet Meg. Lucky her, to have two guys with the names Ash and Grayson to hang out with... Nice! I can't wait to read Meg's story. Thanks for stopping in, Sheri. Thanks so much for having Meg on your blog, Kai! I'm so glad she could visit, Kelly. Thank you. Sounds like a great book. Love these character interviews! I agree, sounds like a fun read. Doesn't sound like Meg will have a hard time finding other boys, does it? Looking For Guests with Character!